Specifications WE ARE LEADING MANUFACTURER & EXPORTER OF MAGNESITE LUMPS. Being a well-distinguished company in the market, we are into offering Raw Magnesite Lumps. Leveraging the skills of our qualified team of professionals, we are instrumental in offering a wide range of Raw Magnesite Lump. We offer Raw Magnesite which is used as raw material in varied applications. 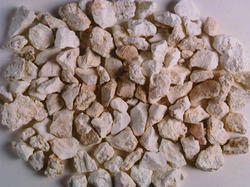 This Raw Magnesite is offered to the world wide customers at highly competitive prices. The company is a highly acclaimed Manufacturer, Exporter & Supplier of Magnesite Lumps. The company offers the finest Magnesite Lumps to the clients in the safest of packaging. 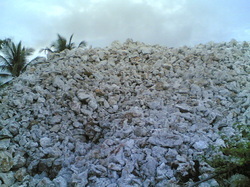 This is the raw material in Magnesite alied manufacturing and has an Mgo of 35- 40%. This material can be supplied from sizes 200mesh to 200 mm. Dead-burned magnesite is produced with selected natural magnesite through purifying by calcining in shaft kiln. It's an ideal material for making bricks and basic ramming mass etc.